Tired of grease stains and dust from your concrete garage floor? Our epoxy flooring contractors can transform your Las Vegas garage from boring to brilliant. Epoxy can be used to achieve the look of car showroom and it’s surprisingly affordable. Our epoxy coating service creates a tough and long-lasting surface that resists oil, grease, and more. Forget what you know about epoxy floors; this versatile solution is for far more than hospitals and offices. Not sure if garage epoxy flooring is worth the investment? Here’s why we love installing floor epoxy in Las Vegas garages. You never need to worry about water or spills seeping under your epoxy floor and causing damage. An epoxy coating creates a seamless surface that’s highly resistant to water and spills for easy, pain-free cleaning. Once the epoxy is applied and sets, you don’t need to worry about time-consuming upkeep.Simply sweep or vacuum your floor regularly and spot clean fluid leaks and spills as needed. Epoxy can improve the safety and appearance of your garage all at once. We can add additives to your epoxy coating for a safe anti-slip surface. Most garage floor products wear out and show their age within 1-3 years. Epoxy coatings can last up to 10 years or longer with regular use. Some epoxy coatings can even last up to 30 years before any chips or lifting. You don’t need to worry about spilled oil, gas, or other chemicals when you have an epoxy floor. Epoxy is specially formulated to withstand solvents, acids, and chemicals. 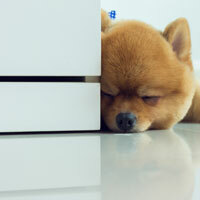 Here’s a little-known benefit of epoxy flooring. It can improve brightness in your garage or workspace by up to 300% with a high gloss finish. 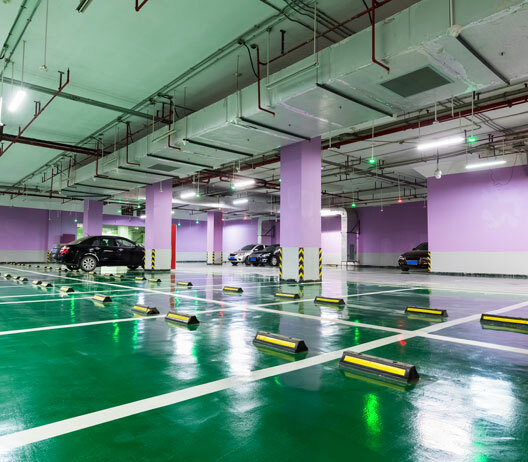 Don’t waste your money on a garage floor that can’t withstand vehicle traffic and heavy use. Epoxy coatings are rated for industrial use with the strength to withstand high traffic. Want something that really stands out? A metallic epoxy floor makes a statement. After adding a metallic pigment, we can create a unique look with blowers and squeegees. Achieving a long-lasting epoxy floor is a four-step process. It all begins with careful preparation of your existing concrete. This step is essential for superior adhesion and a smooth surface. We fill all seams and cracks in your concrete before grinding the surface. Depending on the condition of your concrete, we may also need to remove oil spots and degrease the surface. The next step is adding a tinted epoxy primer coat to the grinded floor. A layer of decorative chips will be added next to customize the appearance of your floor. We offer a full range of colors and we can add a decorative finish for a one-of-a-kind floor. Finally, a durable and chemical-resistant top coat is added to keep your floor looking new. Don’t hire just anyone to install garage epoxy. 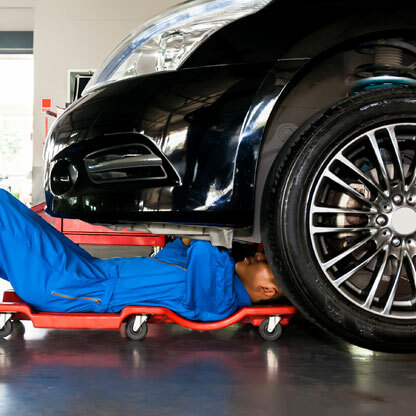 We ensure the best possible results with a dedication to doing the job right. Unlike some epoxy contractors in Vegas, we never cut corners that can lead to premature floor failure. Epoxy is most popular in Las Vegas for garages, but it has many other uses. If you have an unfinished basement, epoxy can be an excellent flooring option as it’s water and slip resistant. It can also be customized to match your home’s decor. We have also installed epoxy on ramps and stairs to create a safe surface. If you have a ramp or steps leading from the garage to the home, epoxy creates an even, anti-slip surface. We also install epoxy flooring for commercial spaces. Epoxy flooring is more common than ever in Las Vegas. Still, many homeowners know very little about this product. Have questions about installing epoxy in your garage or basement? Here are some of the most common questions we hear. We are always available if you have more specific questions about floor epoxy. How Is the Floor Prepped Prior to the Epoxy? Properly preparing your concrete slab for epoxy is the secret to a long-lasting and beautiful floor. Our epoxy contractors always take as much time as necessary to prepare the concrete without cutting corners. How your floor needs to be prepped will depend on the condition of your concrete. Any cracks or seams should be filled or repaired prior to applying an epoxy coating. All stains, oil spills, and paint should also be removed. Your concrete will also be grinded to create a plain concrete surface for proper bonding. Even a new concrete floor in perfect condition must be etched before epoxy is applied. We will also test your concrete for moisture problems that will prevent the epoxy from bonding. If any moisture is found, epoxy should not be added. The water pressure in the concrete will break the bond. How Long Does an Epoxy Flooring Job Usually Take? Most garage floors require at least 1 day for to prepare and repair the surface. To create a durable floor, two coats of epoxy are necessary. Each coat of epoxy must cure overnight. Immediately after your epoxy floor is applied, everything should be kept off the floor for 24 hours. Vehicles and heavy objects should be kept off the floor for 72 hours. It takes about 7 days for epoxy to fully cure. During this time, avoid washing or scrubbing the floor. Note that epoxy flooring must be applied when conditions are right. 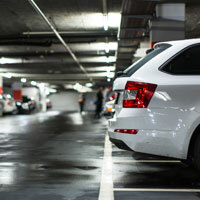 Your garage floor must be completely dry and temperatures must be above 50 degrees F.
When Wet, Is the Floor Slippery? Can I Avoid This? 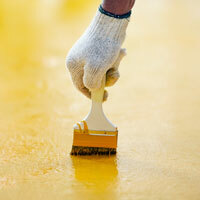 One of the most common questions about epoxy is whether it creates a slippery surface. No one wants a garage floor that is so slippery it becomes a safety hazard. An epoxy floor has a similar surface to a basketball court. It offers grip, but it will be slippery when wet. We recommend adding a skid-resistant additive to your epoxy before application. These granules, usually made from quartz, add traction. Are There Different Color Options of Epoxy? Epoxy floors come in a huge array of colors ranging from neutral tones to vibrant reds, greens, and yellows. Colors can also be combined by adding two or more different color chips. For a truly unique floor, we can also install a metallic epoxy floor. Metallic epoxy can be further customized with one-of-a-kind designs. We create designs with blowers, squeegees, and alcohol that can make your floor resemble a lava lamp, lightning, and more. 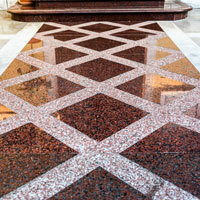 One of the most popular options is our metallic marble epoxy coating. Are There Different Types of Epoxy Coatings? 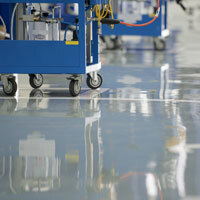 Yes, there are many types of epoxy floor coatings we can use. The best garage floor epoxy will depend on how you will use your garage. All epoxy floor coatings are resins that come in two parts that are mixed just before application. There are three basic types of epoxy coatings: 100% solid, solvent-based epoxy, and water-based epoxy. 100% solid epoxy is almost pure without solvents that evaporate. This type of epoxy is expensive and very hard to apply because it hardens so fast. It should only be applied by a pro. Water-based epoxy has two parts applied before application with 40-60% solids. Water-based solvents have no harmful fumes from solvents. Solvent-based epoxy products have 40-60% solid epoxy. This is the type of epoxy we prefer as it penetrates and adheres well to concrete. It also comes in a wide range of colors. Still, there are drawbacks to solvent-based epoxy. The solvents used in this product can be dangerous and require using a respirator.